Ketchikan regularly gets up to ten thousand visitors off the cruise ships in a day. Many of them book tours and excursions through the ship, which means the tour operators pick them up on the pier to transport them to their company’s location. That being the case, the cruise ship pier can get pretty hectic at times. 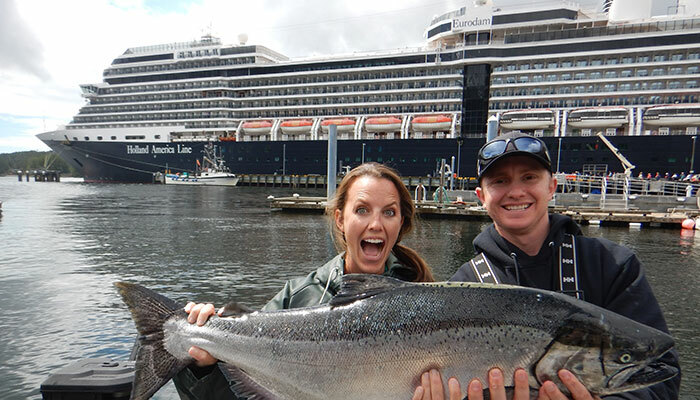 Baranof Skiff Excursion’s guests are usually some of the first to disembark, as our salmon, halibut, and culinary fishing excursions here in Ketchikan typically run the duration of our clients’ stay in town. Bonnie makes sure everyone gets where they need to be at the right time. Depending on a world of factors such as departure time, specific excursion, mobility considerations, and weather, Bonnie must coordinate pick-ups and drop-offs for all our guests throughout the day. With a dedicated crew of dock reps at her disposal, and the option of putting our fishing captains to some actual work, she sends forth her minions to guide our clients to and from our marina.